It is being reported that Shaun White (who was recently selling most of his homes) has purchased half of a “micro-compound” tucked into Laurel Canyon and formerly owned by “celebrated film, television and Broadway composer and lyricist Marc Shaiman“, according to story in Variety.
. . . property records show a corporate entity linked to two-time Olympic gold medalist Shaun White purchased a 50% undivided interest in the property. 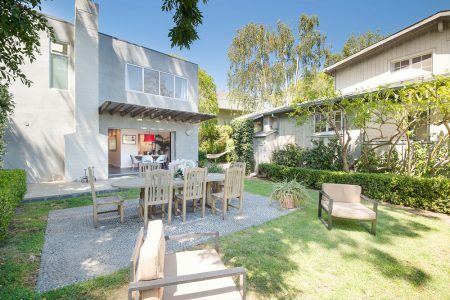 Unconfirmed scuttlebutt on the celebrity real estate street is the other half interest was acquired, via blind trust, by the ginger-haired snowboarder’s fashion-savvy musician girlfriend Sarah Barthel, one half of the electro-pop duo Phantogram. The place reportedly features a “total of 4,304-square-feet with 5 bedrooms and 4 full and 2 half bathrooms divided between two residences and a soundproofed recording studio.” Sounds like Mr. White is finally settling down in what looks to be an epic, peaceful spot within striking distance of Hollywood. Nice. Previous post: RIP Bruce Brown, Thanks.